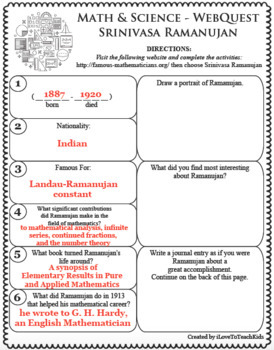 FAMOUS MATHEMATICIAN - Srinivasa Ramanujan FRS was an Indian mathematician who lived during the British Rule in India. Though he had almost no formal training in pure mathematics, he made substantial contributions to mathematics. 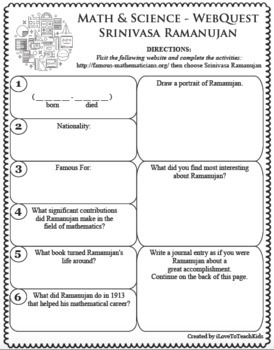 Engage your learners in fun, interactive, and creative ways to discover more about RAMANUJAN using this WebQuest. Activity is differentiated allowing students to respond to open-ended questions reaching individual levels. INSPIRE your students! This WebQuest is NO PREP and READY TO GO! Great for sub (substitute lesson plans). It works well as a quick, textbook-free, in-class, or homework activity. Just print and go! Allow your students to DISCOVER more about famous scientists and mathematicians throughout the centuries! Active, online learning opportunities for students. WebQuests are designed to provide teachers with opportunities to differentiate by allowing students to respond to a varying range of questions.